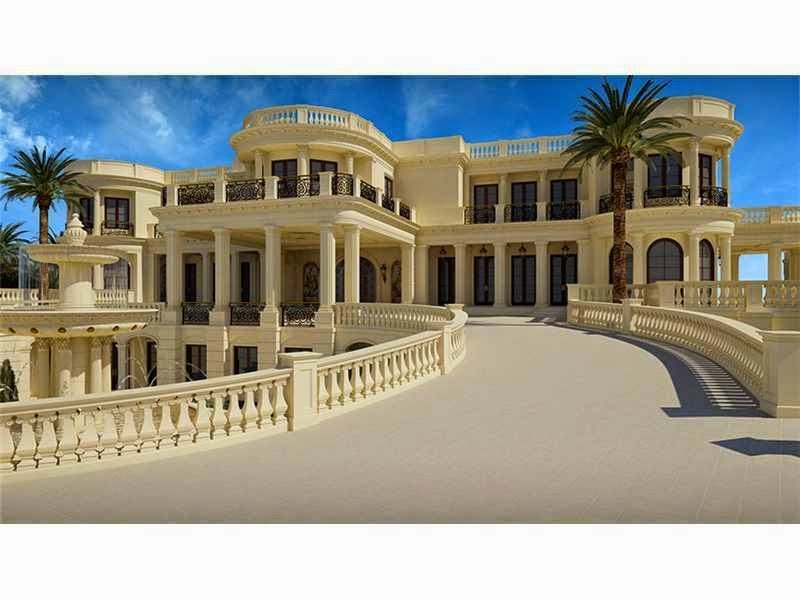 This spectacular oceanfront palace was just listed on Millionaires Mile in Hillsboro Beach Florida and includes 60,500 square feet of Versailles inspired excellence. "Le Palais Royal" features an immaculate 26-foot fountain plated in gold-leaf, a $2 million dollar marble staircase with steel-iron and gold leaf railings, 11 bedrooms, 17 bathrooms, 4 of the 11 bedrooms are master suites with their own private jacuzzis, the nation’s first-ever in home IMAX Theatre with a 50 by 27-foot screen and seating for 18 with a bar and IMAX lounge, a high definition 3-D television set and a 1,300-gallon fish tank with live coral and other beautiful sea creatures in the enormous living room, a "air-conditioned canine room" for your guard dog, and that’s only the beginning of what this mansion has to offer. Le Palais Royal’s amenities are the epitome of top of the line, this property lies on 4.4 acres and includes 465 feet of pristine beach on the Atlantic Ocean, a 492-foot private dock that can accommodate a 185-foot yacht, a underground garage with room for 30 cars, a 4,500-square-foot infinity-edged pool that has six cascading waterfalls, a double-loop, a swim-up bar, a fire pit in the middle of the pool, a LED-lit water slide, and an infinity-edged jacuzzi suspended above that spills down into the pool. This unbelievable estate also features a spa, massage room, gym, and putting green. The kitchen includes custom cabinetry from La Cornue Grand Palais. The cabinets will be made of solid mahogany with 22-carat gold leafing. The construction method of this oceanfront mansion is also very unique, rather than using cinder blocks, the homes foundation is supported by 350 concrete piles that burrow into the ground, ensuring that the beachfront mansion could withstand severe weather. This palace was designed by Joseph Leone of Denio Madera Design is currently in its final phase of construction and slated for completion before the end of 2015. Hillsboro Beach is located in Broward County on a small peninsula north of Pompano Beach. It is 3.2 miles from the Hillsboro Inlet on the south to Deerfield Beach on the north and is bordered by the Atlantic Ocean on the east and the Intracoastal Waterway on the west. Hillsboro is home to the Hillsboro Lighthouse that was completed in 1907 and marks the northern end of the Florida Reef. It is very special because it contains a 5,500,000 candlepower light and is the most powerful light on the east coast of the United States. Hillsboro Beach has long been thought of as “Florida’s Magnificent Mile” for all of the scenic pristine beaches, lovely boutique’s and divine dining options.